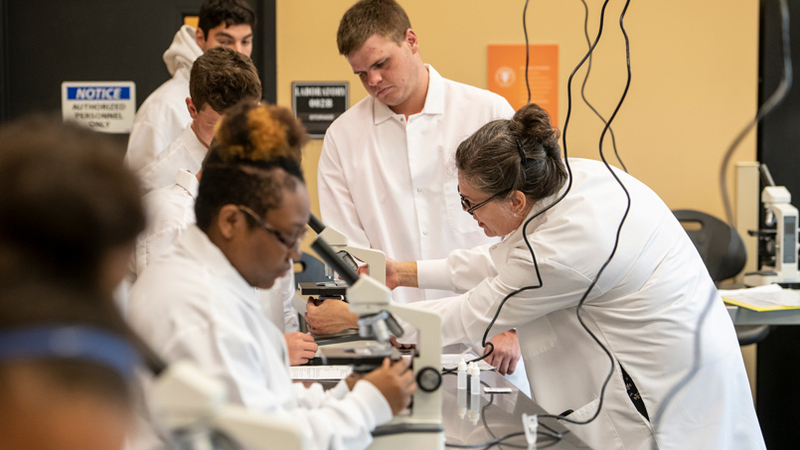 With a focus on molecular environmental biology, our Bachelor of Science in Biology will provide you with skills and experience that can be immediately applied to the workforce or to continued training and graduate-level study. In this program, you can expect to learn by doing and experiencing. You will literally get your hands dirty to solve problems and accomplish learning objectives. The molecular environmental biology program includes a unique combination of biology, chemistry, physics, math and social sciences coursework, supplemented with science communication, leadership and professional development opportunities to produce exceptionally well-rounded students. You will receive inquiry-based learning through hands-on field work in the environment. Relevant skills and problem-driven experiences will be practiced in each course, lab and field assignment. Extensive networking opportunities with professionals, whose experience includes land use, agriculture, soil science, urban biomes and wetlands, will be available to you. There are two curriculum tracks to choose from—one of which provides rigorous preparation for medical or veterinary school. Below are some of the potential career opportunities available to graduates with this degree. Additionally, you will find national statistics for average annual salaries and projected job growth, as identified by BLS. gov statistics. Salaries can vary based on the market in which you live and the prior experience you bring to the position. Professor Good is an experienced educator with a demonstrated history of working in biomedical research settings from academia to the government sector. Her focus is cell and molecular biology.